Now if there were one mini/crossover that I enjoyed (even through all the mutant zaniness) it was the Mutant Massacre. Sure, it was a little much with teammates all up in each others’ grills, but it was leading somewhere. Not so with this issue. You’ve got Sabretooth running around what’s left of the Morlock tunnels going through what Wolverine was during this time. Maybe something to do with the moon? There’s a bit at the beginning where Daredevil saves some guy, but is harassed by him because Daredevil is upping the vigilante game so the punks up their game in return. This is only my second Daredevil issue, but I find it a little suspect that he can hear heartbeats from four blocks away. Anyhow, Sabretooth is finding it hard to be the animal that he is. Or maybe that’s the man. 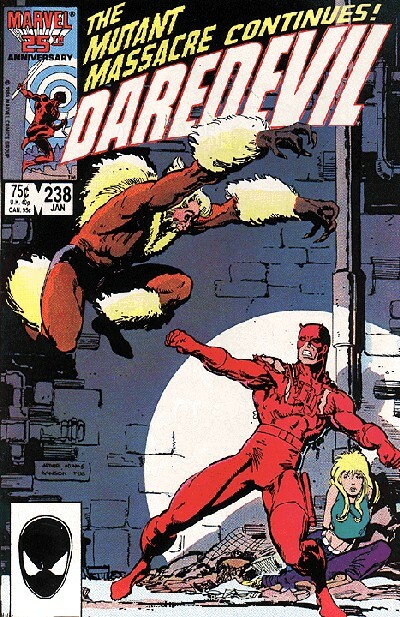 He obviously remembers how to fight, though Daredevil gives him the what-for. So yah, Mutant Massacre tie-in, but two references to anything that is/was going on. A bit of a shame.